Love the Smoky Mountains but also have a love for the water? Lakeside Dreams is the place to be! 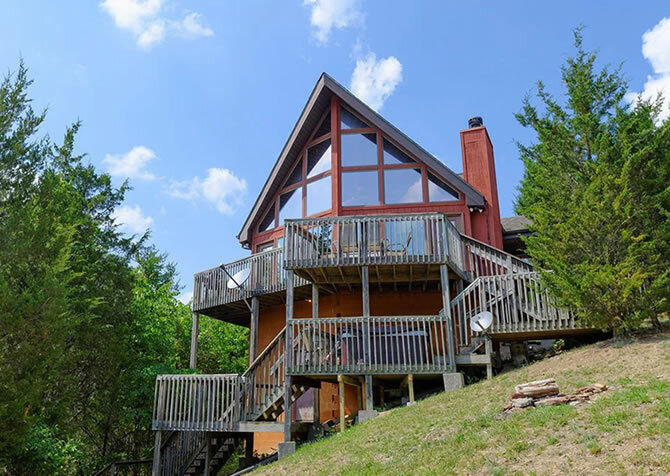 Situated on Douglas Lake in Sevierville, this 3-bedroom, 2-bathroom lakefront cabin for 8 is full of relaxing spaces and fun and convenient amenities. It’s also less than 10 miles from downtown Pigeon Forge, so you can still easily check out the attractions, shows, restaurants, and shops when you want to get out or need a break from playing on the water. Boasting 1,800 square feet, an outdoor firepit, a private dock with easy lake access, and plenty of deck spaces for eating and hanging out, Lakeside Dreams is perfect for fun family vacations and weekends at the lake with friends! Lakeside Dreams has plenty to offer, starting with the fact that it’s pet friendly! Your pup will love splashing around in the water on hot summer days, soaking up some sun on the deck, or snuggling up next to you as you roast marshmallows and make s’mores by the fire outside. Retreat to king and queen beds at night, soak up lake and valley views, treat yourself to a soothing bath in the indoor jetted tub, cozy up by the wood-burning fireplace inside, take advantage of wireless internet, or flip on the big screen TV with DVD player (and VCR) when you just want to hang out. You’ll also have pool and foosball table, along with a charcoal grill great for burgers on nice nights! Welcome to the living room of Lakeside Dreams, where you can enjoy tree-studded views while you cool off in summer, stay warm in winter, or enjoy gorgeous changing leaves in fall. Sit back and watch movies on the big screen TV or warm up with a fire on cold mountain nights. There is a CD player, so you can bring your favorite tunes and a DVD player for movies for the kids. As you unwind, you won’t miss out on the beauty of nature here! Just steps away, the fully equipped kitchen has the dishes, glasses, utensils, tools, cookware, and full-size appliances you need to make meals in the cabin. Grab some groceries before driving to the cabin, and stock the kitchen with all your ingredients for meals, favorite snacks, and drinks. On lake days, you’ll appreciate having all this on hand! You can even get burgers, hot dogs, steaks, and kabobs (and charcoal) to toss on the grill on the deck! It’s the perfect way to end a day on the lake. Situated between the living room and kitchen, find the dining table with bench seating for up to 8. Whether you’re here with family or friends, you can enjoy quality time spent around the table. And of course, large floor-to-ceiling windows showcase the wooded views, so you don’t miss a thing! The bedrooms of Lakeside Dreams are spread across the entry level and loft, giving you some space after a long day. In the first bedroom on the entry level, you’ll find a plush queen-size bed and your own TV. The second bedroom features a double bed, with a shared bathroom just steps away. In the loft, the king-size bed boasts a private bathroom and a private deck! Sit back in the wingback chair with a good book or step out onto the deck in the mornings for some quiet time with your cup of coffee. Each space will be a welcome retreat after a fun day downtown or splashing around and playing on Douglas Lake! Ready for some non-water fun? Head to the rec room in Lakeside Dreams, a space where both kids and adults can hang out and play. Shoot some pool with a cold drink waiting nearby, or challenge someone to a friendly game of foosball. Just want to watch? Kick up your feet and relax on the futon while others play! Of course, your lakeside retreat has some great outdoor spaces! Let’s start with the #1 feature of this Douglas Lake property: a private dock with easy lack access! Bring your kayak, canoe, or tubes for a fun time on the water, or dock your boat (with lake access down the road). With a covered area for shade and an open space for getting some sun, the dock is a great place to hang out and spend the day. You’ll also have outdoor dining to enjoy your fresh-off-the-grill meals, a fire pit that’s perfect for s’mores and late-night chats, and even has lake views! This Lakeside Dream retreat has it all! Along with fun on Douglas Lake, Sevierville, Pigeon Forge, and Gatlinburg provide endless opportunities for entertainment. Enjoy go karts, laser tag, miniature golf, arcade games, dinner shows, outlet shops, boutique stores, art galleries, pottery shops, a variety of restaurants, old-fashioned candies, annual events, and so much more! Can’t get enough of the water? Summertime fun awaits at Dollywood’s Splash Country! Find water rides, kids’ water features and splash pads, and a lazy river great for relaxing all day. Ride the Great Smoky Mountain Wheel, sip on moonshine, listen to live music, shop at boutiques, and play The Escape Game at this popular Pigeon Forge all-in-one attraction! A convenient and cheap way to get around, the Pigeon Forge Trolleys are fun for all! Hop aboard with fares starting at just $0.50 and find stops at major attractions and popular shops!